London Hotels, Guest houses and bed & breakfast accommodation in around near Limehouse all with real-time, confirmed online reservations. Limehouse is a place in the London Borough of Tower Hamlets. It is on the northern bank of the River Thames opposite Cuckold's Point and between Shadwell to the west and the Isle of Dogs to the east. Limehouse Rail station serves the East End of London area. This station is situated between Wapping and the Docklands, and serves as a barrier between the heart of the East End and Docklands. Limehouse is served to the east by Upminster and Barking and Stratford and to the west by Cannon Street. Holiday Inn Express London Limehouse, the ideal location for business and leisure travellers visiting London. The hotel is located in the heart of London's dynamic Docklands area and is only minutes from the financial district of Canary Wharf. The Limehouse DLR station is located only a short walk from the hotel, allowing convenient access to the ExCeL exhibition centre and London City Airport. With good transport links, family-friendly rooms, restaurant, coffee shop and bar, this Premier Inn is right in 'The City', a short walk from Tower Bridge, the Tower of London and the Thames. 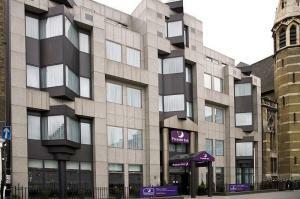 The Ibis London City is ideal for tourist or business stays. Located in the centre of London's financial district, 20 m from Aldgate East station, it is a few steps from Liverpool St, the Tower of London and the celebrated Tower Bridge. It has 348 rooms, including 19 accessible rooms. The hotel has a restaurant and also a bar offering snacks 24/7. Wireless internet access for business guests. Public covered parking close by.